As a homeowner, at some point you may decide your kitchen, bathroom or family room spaces are no longer suitable for your particular living situation. Preferences change, kids arrive, circles of friends expand – the list goes on. Fortunately, this doesn’t mean you have to move or completely gut your existing home to achieve an ideal design layout. Nicholas Construction excels in helping homeowners realize their design vision by re-utilizing the existing home footprint and maximizing space functionality – without the need for additional square footage. “We’ve done many kitchen and bathroom projects where we can renovate the existing footprint of the home and change the flow of it and accomplish what the owners wanted in a completely new home,” says President Kyle Nicholas. 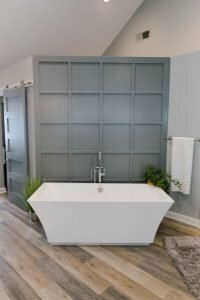 During a recent remodel, Nicholas and his lead designer, Laura Sherrell, were able to transform a northside Indy home the owners felt was lacking in space functionality. Through multiple creative design approaches, including removal of several walls, reconfiguration of the bathroom, including removal of a large garden tub that dominated the space, as well as consolidation of separate closets into one, the Nicholas Construction team was able to open up the space and give the owners a larger master shower and vanity. With comprehensive experience and a lengthy portfolio of proven results, the Nicholas Construction team can take the lead on reconfiguring your kitchen, bathroom, central living space, room addition, outdoor living area and more. Call 317-607-9465 to schedule a remodel or new build consultation. Visit nicholas-construction.com for more info.